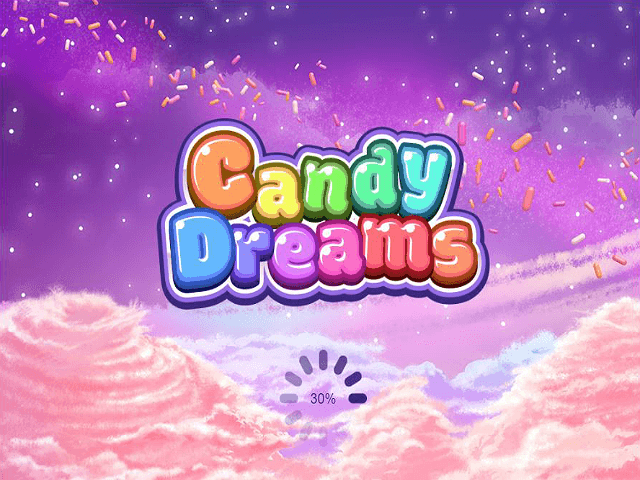 Microgaming's new Candy Dreams Slot is a super-sweet game that makes you think of Care Bears spinning the reels in a faraway galaxy where everything is made of candy. We're guessing the company was inspired to make the game having consulted thousands of alpha males on their secret gaming desires (don't worry, your secret's safe with us). 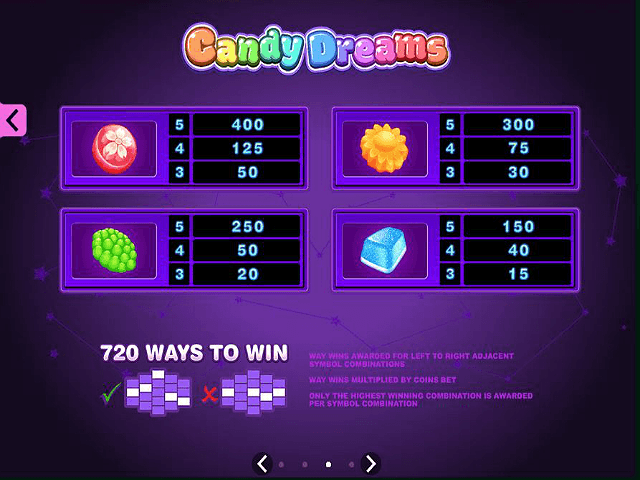 However, don't be fooled by the sweet appeal of Candy Dreams, because in this land of make-believe, there are 720 ways to win across the five-reeled universe where sweets can be worth their weight in coins! 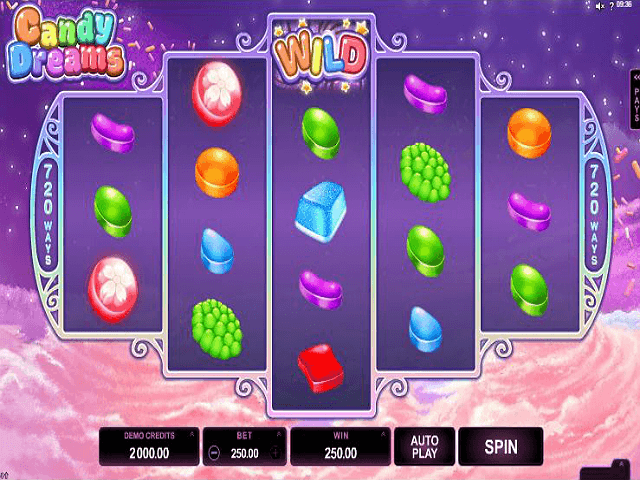 Microgaming's Candy Dream slot definitely comes sugar-coated, with a 4-5-4-3, 5 reel layout. Although there's nothing highly innovative about it, this gaming fantasy surely is a touch of fun, taking place atop clouds of light, fluffy candyfloss – within a galaxy made of brightly coloured sugar and sweets. Decorated with shades of purple and pinks, plus brightly coloured symbols, it's a game for a Monday morning when the boss isn't looking. The potential for sweet rewards is written in the constellations of the sugar-sprinkled stars, with symbols including a variety of different coloured sweets, candy dream icons, wilds, curly scatter lollipops and bonus pink planets. When all the winning ways are calculated, there are a sweet 720 different rewards on offer. The game features an interactive planetary guessing game, free spin rewards and a 95% return-to-gamer ratio. *A further eight coloured sweets symbols pay out up to eight-times for winning combos. 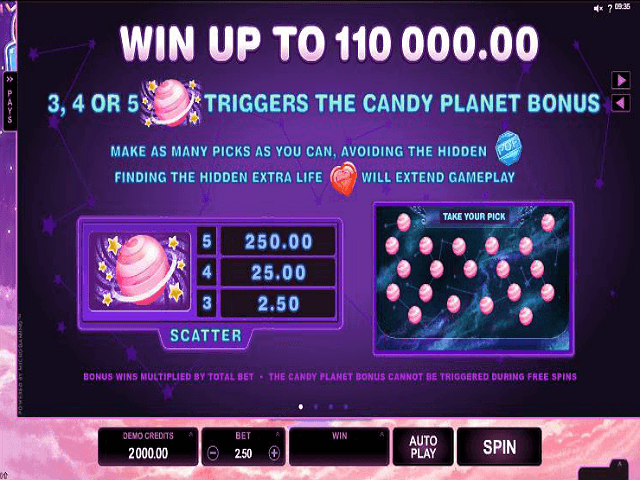 Landing three or more Candy Planet scatters on the reels launches the bonus game. This has a simple element of interactivity; your challenge is to use your bonus plays to select winning bubbles containing cash prizes, while looking for extra lives and avoiding the POP icons that cause you harm! If you encounter the dreaded 'POP', you have time to find the antidote heart before it's all over and back to the sweet safety of the main game. There are 20 choices to make, so we hope you've got good intuition. You can lick your lips when you match three, four or five rainbow swirly lollipop scatter icons on the reels as 12 free spins are on their way. Additionally, when the Special Wild gift box icon hits on the middle reel, the game awards you a maximum of three wilds across the reels, plus free spins. This is a cute-looking slot game from Microgaming that may or may not satisfy your sweet tooth and appeal to your inner child. But don't judge a book by its cover – it has grown-up casino payout potential and gratifying playability. 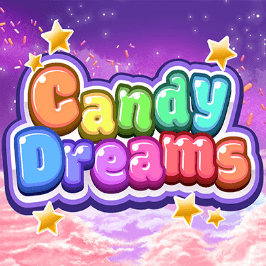 If you like Candy Dreams - You'll like these slots too!